"Journal of Mathematical Physics, Analysis, Geometry" published since 1994. "Journal of Mathematical Physics, Analysis, Geometry" was founded in 1994. Its former title was "Matematicheskaya Fizika, Analiz, Geometriya" (MAG) (until July 2005). "Journal of Mathematical Physics, Analysis, Geometry" is a quarterly scientific journal. Founders: National Academy of Sciences of Ukraine, B.Verkin Institute for Low Temperature Physics and Engineering. Register Number: №9023 КВ from 03.08.2004. 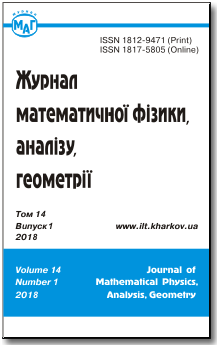 "Journal of Mathematical Physics, Analysis, Geometry" indexed in: Scopus (since 2008), Web of Science (since 2010), MathSciNet (since 2005), Google Scholar (since 2017), Vernadsky National Library of Ukraine (since 1994), eLIBRARY.ru, Math-net.ru (since 1995).